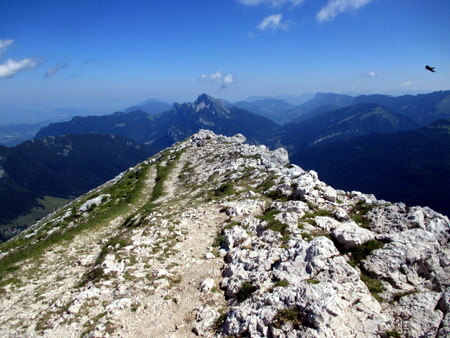 This is a magnificent walk - definitely in the top five of Chartreuse. It deserves its difficulty grading, as there is a short "easy" rock climb, and a very exposed path, but it isn't any harder than the Anoch Eagach, or the scrambling parts of the Cuillins ridge. This walk basically climbs halfway up from the col de Porte, takes a rising traverse all the way around the mountain, and completes its ascent almost above where it started. Note that this route covers nearly all the ground covered in the other route described up Chamechaude (map). The time assumes ascent and descent. There is ample parking on the road at the col de Porte (1320 m, grid ref. UTM 31T 71699 50189), or alternatively, you can park on the track leading to the piste. Follow the track to the piste area, passing a low building on the left, after a few minutes. Take the next track (under 10 minutes from the car) leading into the forest to the left. This ascends gradually to the north, until returning to the south. At the end of the track (1547 m) a footpath ascends to the north before returning, and emerging out of the forest into pasture. This leads to a cabin, the Cabane du Bachasson, and spring (1635 m), reached some 40 minutes after leaving the car. From here take the path below the cabin, that traverses towards the south through the forest. Some ten minutes later a flimsy fence is crossed, and the path divides. Keep to the left, and you soon leave the forest. This path takes you round the end of Chamechaude, but then becomes a little obscure. Keep up as much as possible. Some 45 minutes after leaving the hut, a valley which emanates from a prominent gully (the brèche Paul-Arnoud) splits the flank of the mountain. Follow some scruffy zigzags to reach the Chamechaude cliffs looming over you, and cross the top of the valley. The path is now more obvious, and a pleasant walk with superb views follows, taking a route close to the high summit cliffs. Soon after this, you cross a rise, and the cliffs of Dent de Crolles come into view, with Mont Blanc looming over its crest to the left. Half an hour later, you may spot a path coming up the slopes from the east. You now need to look for a couple of arrows pointing the way up two short scrambles (Difficulty 3), divided by a short traverse along a ledge to the right. If you start to descend, you have gone too far. The climbs lead onto the Jardin - the lower of the two prominent shelves on the northern edge of Chamechaude. This is a good spot for lunch, which you will inevitably have to share with the alpine choughs. The route now heads down alongside the cliffs for a couple of hundred metres, and then round the corner onto the western flank. The next few hundred metres are along an exposed path on a thin ledge with cliffs above, and cliffs below. It's easier enough, but it would be difficult to provide support for anyone who was nervous in such situations. The musk orchid may be found here in profusion at the end of July. The traverse finishes down a short rock rake. A few metres further on, you will see a large calcite boulder at the foot of a gully. You are now above where you started your walk. The route ascends the impressive gully (easier on the right to start with) for some 10 minutes, before emerging onto the summit slopes. This is ascended easily using the zigzags. There is no mistaking the summit ridge - it plummets on the eastern side by a couple of hundred metres. As usual, the views are superb, with the cliffs of Dent de Crolles and the Grand Som being particularly impressive. You need to be a little careful of fast-flying swifts and low-flying gliders, but it's a good place to sunbathe and admire the view. Some 20 minutes after leaving the summit, the path passes by the brèche Paul-Arnoud, a cable-assisted ascent up a chimney previously seen from below. Soon after, the path starts to descend, and joins the other route. This area of pasture has a particularly fine display of martagon lily in the early summer. The path then returns north reaching a large mushroom-shaped rock, la Folatière (1743 m), some 40 minutes leaving the summit. Follow the zigzags down to the cabin, and you then reverse the ascent and arrive back at the car within 90 minutes of leaving the summit, after an excellent day in the hills.